Paleontologists from the University of Florida have discovered that the dentition of an ancient great white shark relative indicates it probably descended from makos rather than giant megatooth sharks such as megalodon. The study is published in the journal Palaeontology this week and centres on the description of new species Carcharodon hubbelli, an ancient species which appears to occupy an intermediate evolutionary position between the great white and broad-toothed makos. 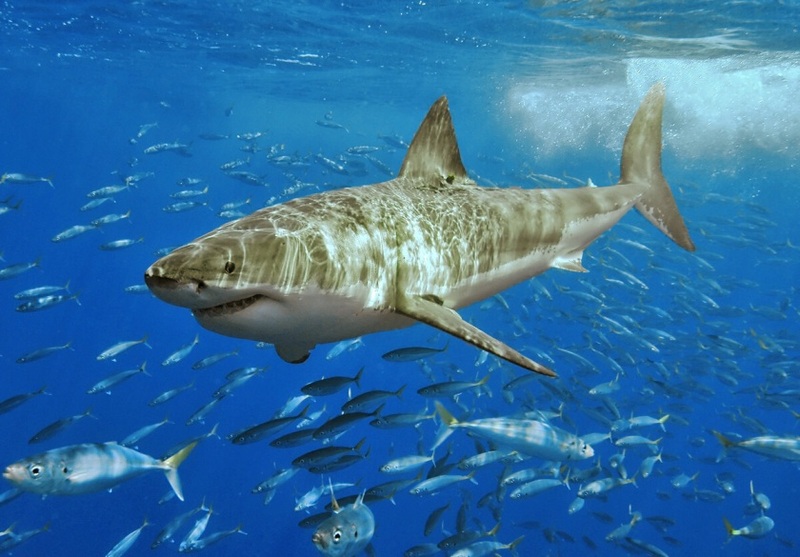 The results suggest that previous theories considering the white shark a relative of megatooth sharks such as the infamous megalodon, Carcharocles megalodon, were incorrect, and that the two may not resemble each other at all. 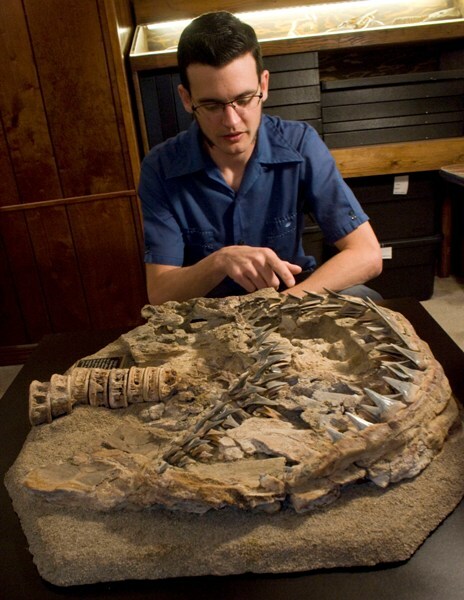 The description of C. hubbelli was based on a complete set of jaws with 222 intact teeth and 45 vertebrae attached, and named for Gordon Hubbell, a fossil collector who recovered the bones in 1988 from a farmer in southern Peru before donating them to the Florida Museum of Natural History in 2009. This proved significant since most ancient sharks are described from single teeth due to the way in which the animals continually shed them, and to find an intact jaw is very rare. The new species was originally described in 2009 but the estimated age of the excavation site, known as the Pisco formation and also containing well-preserved whales and other animals, was based on information from a 1985 study. Using Hubbell’s hand-drawn maps and descriptions of the landscape, researchers returned to the site and found the exact spot the shark fossils were discovered. They used mollusc shells in the fossil horizon to obtain a revised, more accurate estimate of age and concluded that C. hubbelli existed in the late Miocene, about 6.5 million years ago, rather than the early Pliocene, about 4.5 million years ago as previously believed. The team were also able to determine that the new species is related to ancient broad-toothed mako sharks by comparing the morphology of their teeth. Modern-day white sharks have serrated teeth adapted for hunting marine mammals while makos are mostly piscivorous and have smooth teeth. 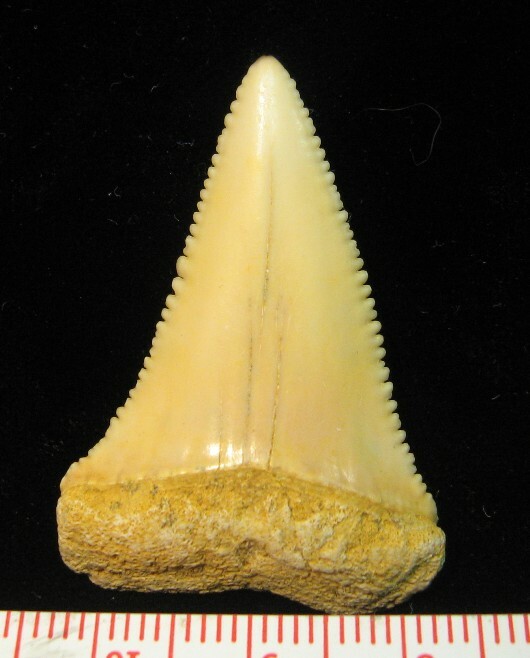 Megatooth sharks also had serrated teeth, and this has previously been used as evidence of their evolutionary relationship with the great white. The teeth of C. hubbelli, however, have a coarse pattern of serrations indicative of a transitory phase between broad-toothed makos and white sharks.. These differences had been pointed out in the original description but were not universally accepted as an indication of the relationship between white sharks and makos due to the supposed age of the fossilised jaws. 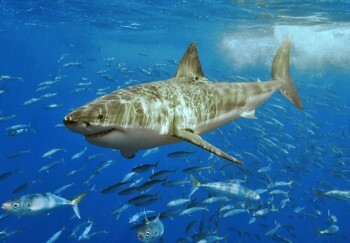 The evolutionary relationships of the white shark have been debated for decades, and shark expert David Ward, a research associate at the Natural History Museum, London, said “fewer people believe the big megatooth sharks are related to the great white sharks than believe the Earth is flat. Everyone working within the field will be absolutely delighted to see this relationship formalised”. For further information please refer to the paper: Ehret D.J. et al. 2012. Origin of the white shark Carcharodon (Lamniformes: Lamnidae) based on recalibration of the Upper Neogene Pisco Formation of Peru. Palaeontology 55(6) 1139–1153.